At age 17, Val Fonteyne left Wetaskiwin to play Junior A Hockey in Medicine Hat (1951 ‑ 1954). 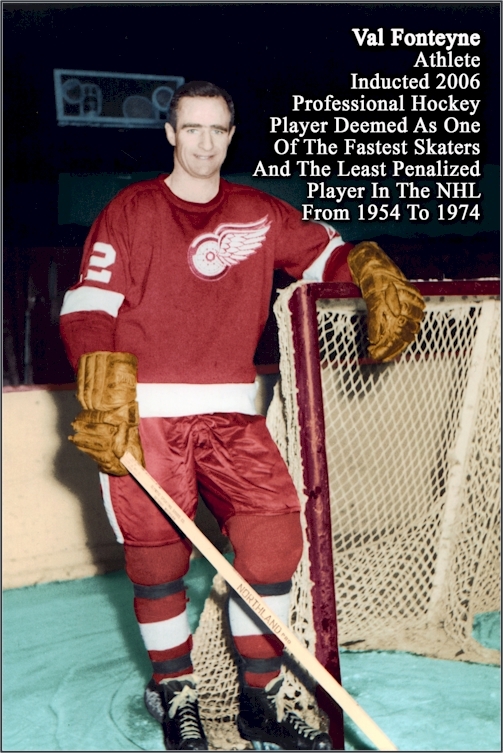 His professional hockey career started in 1954 ‑ 1955. He played seven games with New Westminster Royals, and the rest of the season with Kelowna Packers of the OSHL. 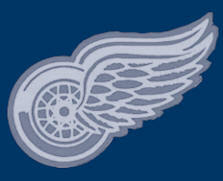 The next three seasons 1955 ‑ 1958 were played with the Seattle Americans and with the Seattle Totems 1958-59. Val posted impressive offensive stats: 108 goals, 148 assists and Bud Poile of the Edmonton Flyers convinced their parent NHL Detroit Red Wings to purchase Val's rights from the Totems. 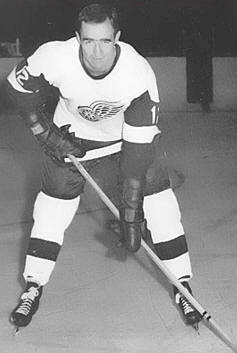 Val Fonteyne played four seasons with the Red Wings (1959 ‑ 1963), 96 games with New York Rangers, then back to the Red Wings (1965 ‑ 1967). 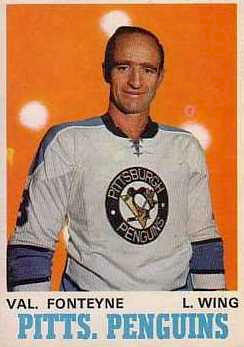 New‑entry Pittsburgh Penguins drafted Val in the Expansion Draft June 1972, Val was selected by the Alberta Oilers. After much thought, Val agreed to a two‑year contract with the Oilers. When it expired in 1974, he retired from pro‑hockey. His hockey career started and ended with W.D. (Bill) Hunter. Fonteyne played more than 1,400 games in the NHL and is statistically one of the least penalized players to have played pro‑hockey. 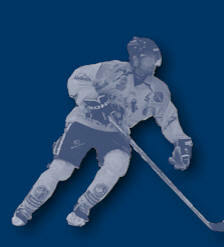 Val played 1320 regular League games and 100 Playoff games. 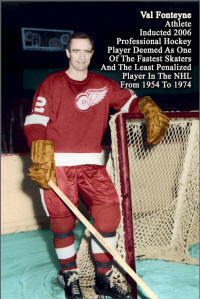 He was assessed a total of 76 minor penalty‑minutes or 38 minor penalties in his entire pro‑career. He played five complete hockey seasons with 0 penalties. Val was deemed to be one of the fastest skaters to have played pro‑hockey. "Without a question, skating was my greatest asset. And because of this I committed myself to the European style of play, not the 'clutch and grab style'." Val came "home" to Wetaskiwin during the off‑season. He excelled in baseball and in fast‑pitch softball. Val played and was captain on the Wetaskiwin Cubs Baseball team. He coached the Wetaskiwin Tire Town Bantams to a Provincial championship in 1975. After his retirement from pro‑hockey, Val joined the Old‑Timer Wetaskiwin Relics and played in several national and international tournaments.